Who doesn't love a good Snickerdoole that melts in your mouth? 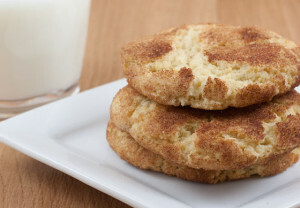 An all time favorite with everyone, Snickerdoodles are easy to make and keeps well for a few days. This delicious recipe is originally from a German family. Preheat the oven to 325 oF. Grease two cookie sheets. Blend the baking soda, cream of tartar, salt, cinnamon and flour in a separate bowl. Cream the butter with both the sugar in the mixer. Gradually add in the beaten egg, vanilla, and beat on high. In another bowl, mix together the cinnamon and sugar. Use an ice cream scoop to drop the cookie dough into the cinnamon sugar and coat it well. Place it on the cookie sheet about 2 inches apart, and flatten it slightly.